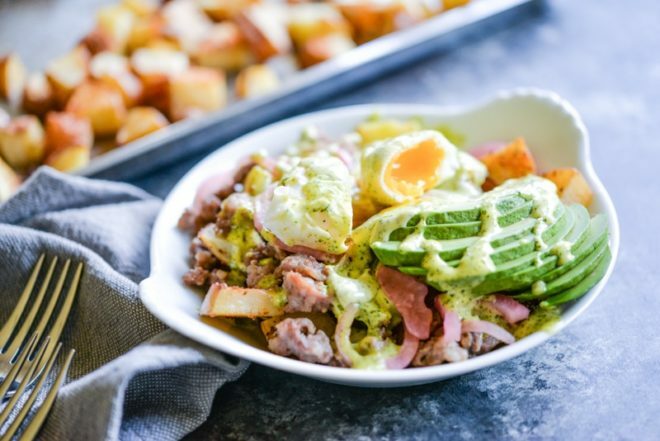 These Loaded Breakfast Fries are essentially all our breakfast dreams come true. 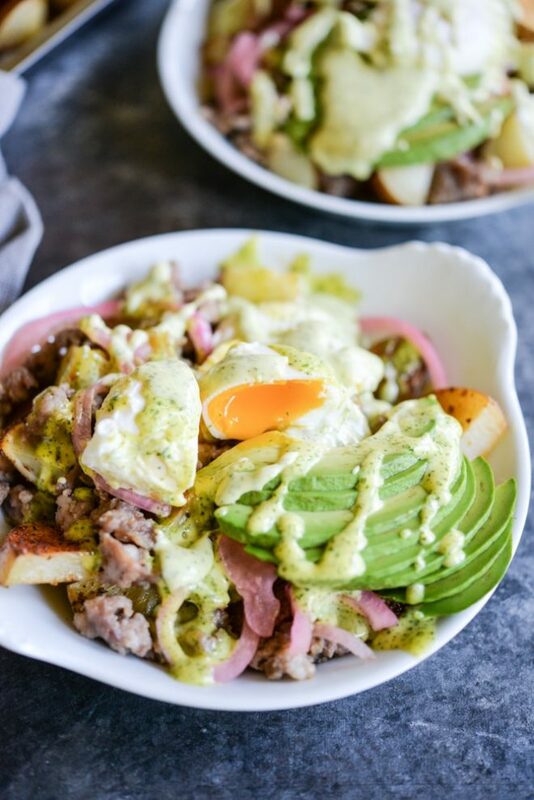 With crispy seasoned fries, sausage, avocado, picked onions, egg, and a cilantro hollandaise sauce, this breakfast bowl is a great way to get a tasty, fun meal on the table. 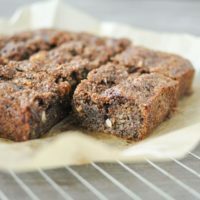 I’m currently fantasizing crashing the nearest sporting event, breaking into the announcer booth, grabbing the stadium mike and yelling, “ARE YOU READY …for this RECIPE?? ?” I know this makes me a complete food geek and I’m good with it. 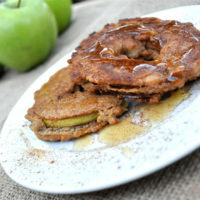 When we were filling out our recipe plans for the blog, we got REALLY excited about this recipe. 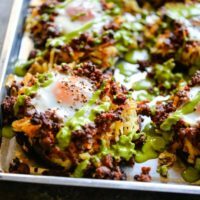 I like to bring you delicious (Paleo-friendly) breakfast recipes on the regular, so we started thinking up a fun breakfast concept. We bounced all over the map and landed at what we wanted in that (and every) moment: fries …breakfast fries. If I saw breakfast fries on a menu, I’d fall out of my chair with excitement. SO, we knew we had to make them. 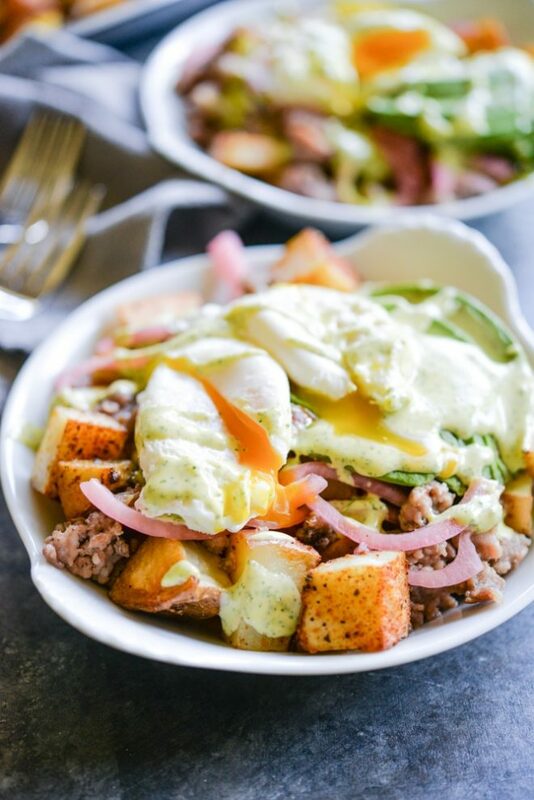 These seasoned breakfast fries are fully loaded with crispy breakfast sausage, pickled purple onions (feel free to use fresh), fresh avocado, a poached egg (feel free to swap in a fried or scrambled egg), and a generous drizzle of cilantro hollandaise sauce. The fries are made “home fry” style in that they’re cut into cubes, heavily seasoned, and baked until crispy. A bite that contains a little of each component is everything we ever wanted in a breakfast. 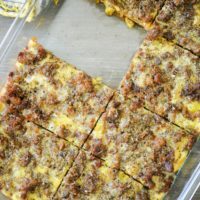 If you’re ever hosting breakfast/brunch or just looking for a fun way to mix up your Sunday breakfast or even weekly meal prep efforts, this is a great option! Guests can make their own bowls, picking and choosing what they want on their plate. Toss potatoes with olive oil and meat & potatoes seasoning. Spread out on a baking sheet ensuring potatoes aren't overlapping and bake for 45 minutes. While the potatoes are baking, cook the breakfast sausage in a skillet over medium heat for 10-12 minutes, breaking up into crumbles. Next, cook the eggs to your preference. Poached or fried would both be delicious! 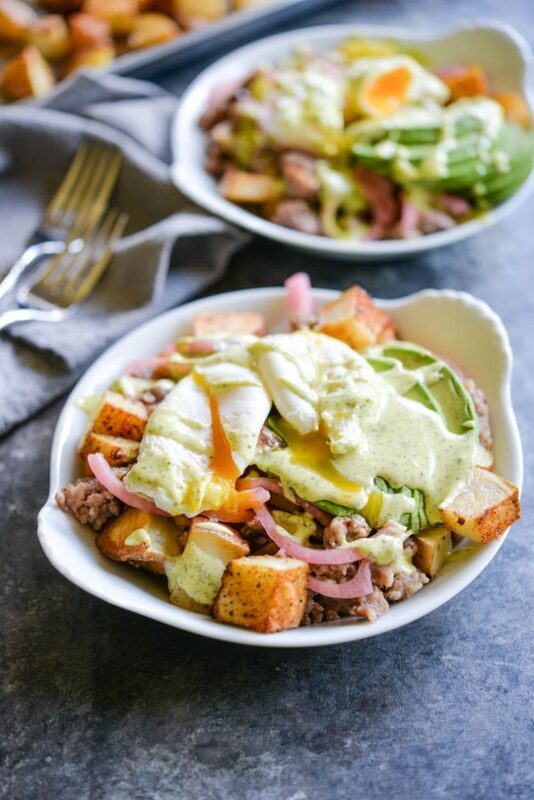 Remove the potatoes from the oven, crumble the breakfast sausage over them, top with eggs, drizzle on cilantro hollandaise, and garnish with pickled onions. Enjoy! Hi, I am a relatively new subscriber, but I have been collecting your recipes into my library for a week or so now. Great ingredients in winning combinations – love it -so inspiring! This break-feast (not a typo!) looks wonderful, however I am a little perplexed by the quantities of ingredients vs the 4 servings specified. 1/2 pound each of potato and sausage per serving? 6 eggs between 4 servings? Did I miss something or was this scaled down from something where the eggs better matched the servings? I know I can adjust any of these ingredients to suit my needs, but was curious about the logic behind this recipe. Hi there, that was a typo on our end, but the portion sizes have been updated- it should be 6-8 servings with one egg per person! Glad you are enjoying the recipes so far! WOAH!!!! This looks so so so good! I love sweet breakfasts as much as the next person, but I actually like savory breakfasts just the tiniest bit more . . . This is going on my MUST-make list of recipes. Like, top priority weekend cooking! Thank you so much for sharing!